While I’m enjoying the time in my home-country, in Dubai is the month of Ramadan. It’s one of the important months for Muslims; during the month they are fasting (no food or drink) during the daytime. Traditionally, it’s normal to brake the fast with dates before Iftar. Iftar includes buffet tables with a large variety of dishes. Mezze is a selection of small dishes, appetizers served before the main course in many countries like Turkey, Lebanon, UAE, Syria, Greece, Cyprus. There are vegetarian, fish or meat mezze. Arabic-style mezze platters often include marinated olives, fresh herbs such as mint and zaatar, labneh (thick yogurt), halloumi cheese, kofta (meatballs) and many others. I guess, almost everyone is familiar with classic hummus – pureed chickpea dip. 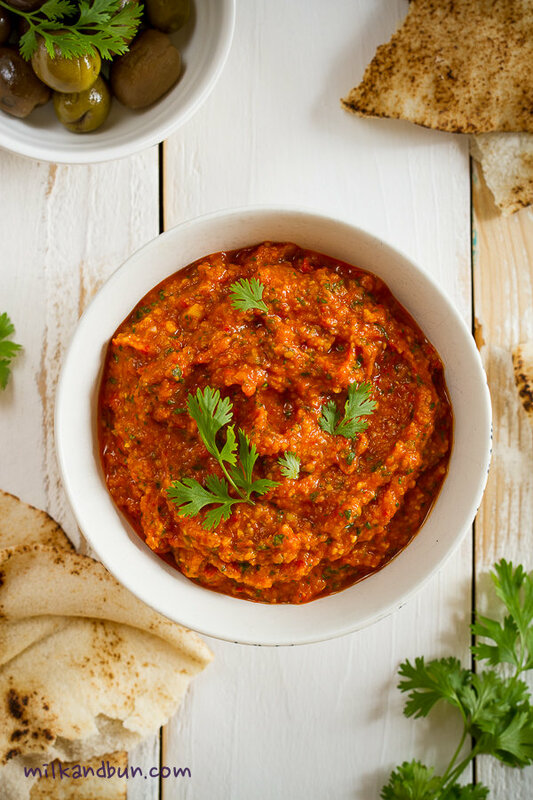 I do like this tasty dip, it’s wonderful with roasted chicken or lamb kofta, or simply with bread. But this time I made unusual hummus -with roasted red bell peppers and pomegranate molasses; it turned out so delicious! I served the hummus with Arabic pita bread, olives and baked halloumi cheese. 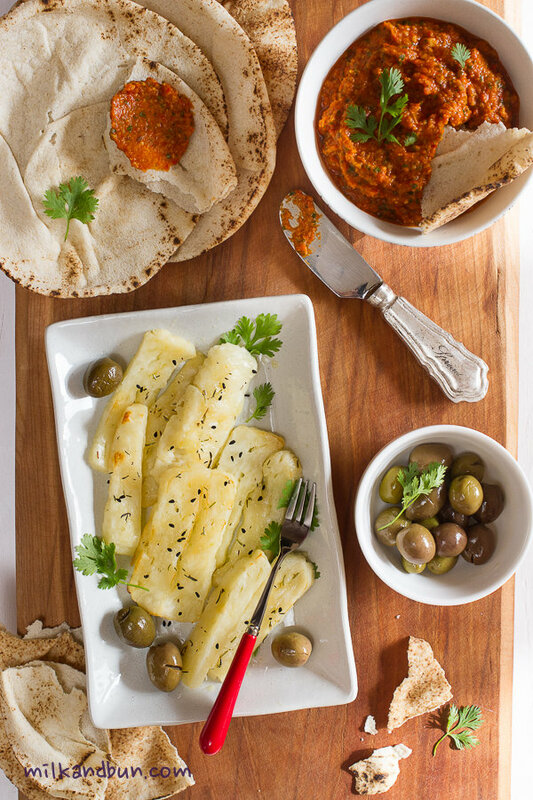 Halloumi cheese is another tasty appetizer, which is pretty popular in Middle Eastern cuisine. Baked halloumi with touch of honey and thyme makes wonderful snack. Serve it warm with bread or salad. Cut peppers into halves and place them onto lined baking tray under the grill for 15 minutes, or roast covered in foil in preheated 180C oven for 30 minutes. Remove their skins. In a small frying pan, heat olive oil, add onion and fry over medium heat for 3-4 minutes, add garlic and cumin and saute for a minute more. In a food processor, add peppers, fried onion, paprika, chickpeas, coriander, lemon and orange juices, molasses if using and pulse several times. Add extra virgin olive oil, and blend again. Season to taste. If you want to make the hummus thiner, add a couple of tablespoons of water. 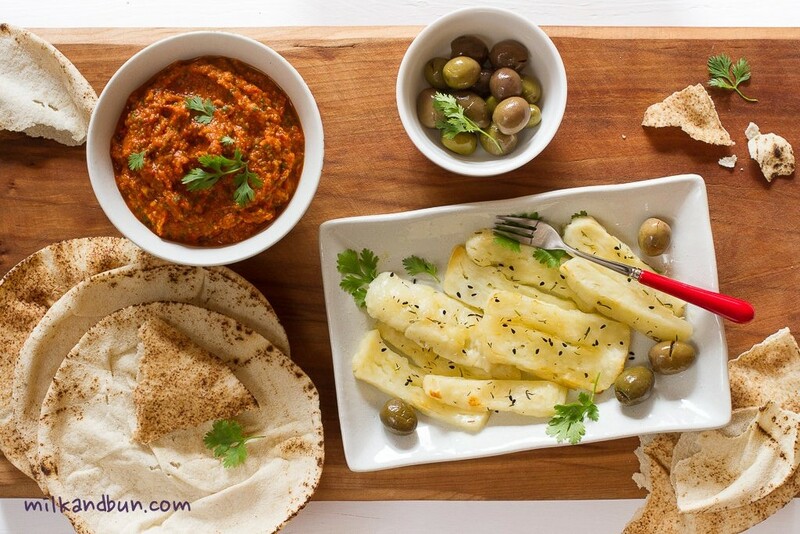 Serve with Arabic bread, pita, crackers or your favourite bread. Cut halloumi into slices. Place onto baking tray lined with baking paper or foil. Mix all other ingredients. Pour over cheese. Bake in preheated 200C oven for 10 minutes or under the grill until just begin to brown.